In our last article we talked about how flooring is a true commitment since it is going to be part of your life for a considerable amount of time. While carpeting has an expected lifespan of 10-15 years, as opposed to some other flooring types that are 25 or more, that is still a considerable commitment, which requires a fostered relationship to ensure it lasts. In this article, we will help you learn how to develop a relationship that will keep the carpet flooring for your Edmonton home beautiful throughout its lifespan. As your Edmonton flooring store, Action Flooring would like to impress upon you the importance of professional installation to ensure a strong basis for a great relationship. Too often, people invest in beautiful flooring and forgo professional installation only to experience problems that may not only show imperfections, but ruin your new floors. The first step is using our online system to schedule all materials required for your project and coordinate the installers. The second step involves our service department. This is where the installers for your flooring project are apprised of everything they need to know so they arrive at your home ready to work. Our third and final step is quality control. Our installers are required to submit a report upon completion of your project and include any issues they had so we can continue to improve our service. We aren't happy until you're happy, so this stage is not complete without your input. Once a solid relationship is established with expert installation, caring for your new carpet is critical to keep it looking great for as long as you are together. Just as importantly, proper care and cleaning will preserve your indoor air quality, protect your warranty and save you money by maximizing its lifespan. While it takes a little maintenance to keep it looking its best, there are many benefits to having carpet installed in your home. Carpet flooring acts as a natural insulator against our cold Edmonton winters, can last more than a decade when properly maintained and reduce noises through its acoustic-buffering qualities. 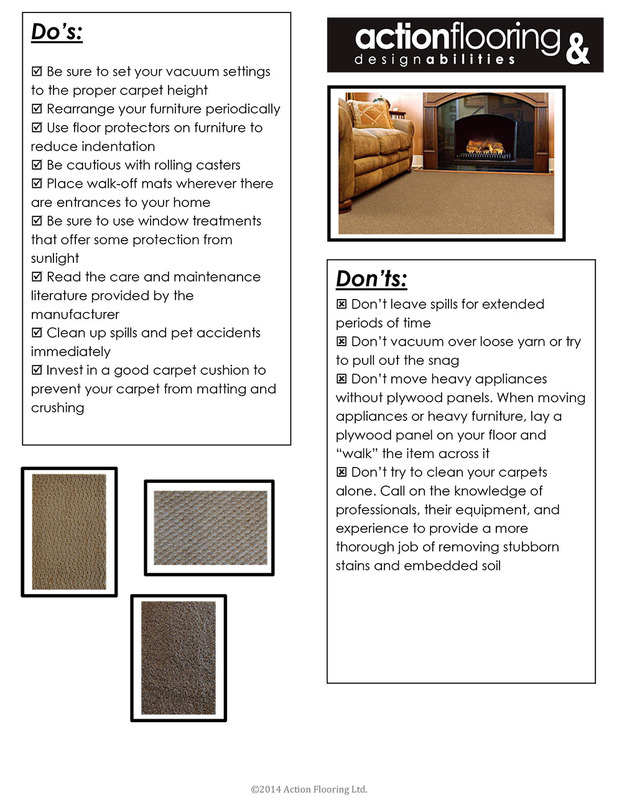 Additional information about carpet care and what you can do to make sure your relationship with it is a long one, see the flyer below. 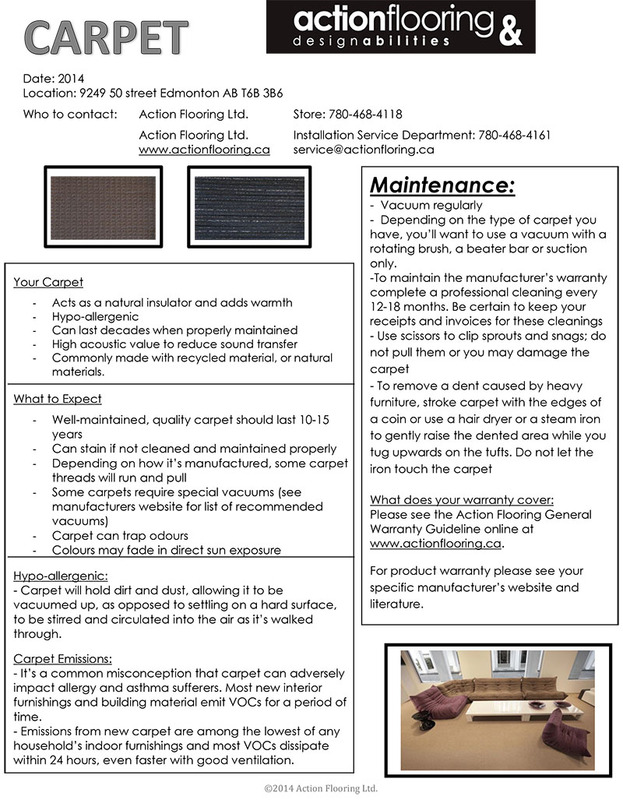 For more information on beautiful carpet flooring for your home, contact Action Flooring. If you would like to see how beautiful carpeting can be, especially the Shaw Floors brand we carry in-store, we invite to stop by the store.